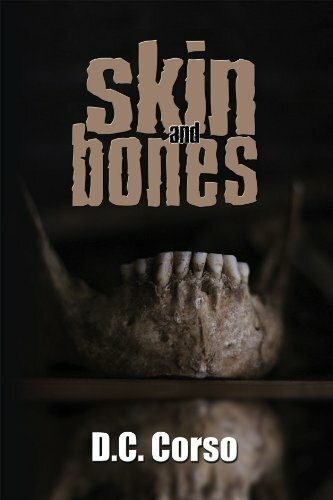 When I was offered the chance to read D. C. Corso’s debut novel Skin and Bones I jumped at it, because I love mysteries, true crime, and police procedurals, and the story – that of an FBI agent joining forces with a small town’s prodigal daughter to track down a serial killer who preys on children, and set just after September 11, 2001, – seemed like something I’d really enjoy. Imagine my surprise when the book showed up and wasn’t even 200 pages long. Well, don’t let the cover – or the size – fool you, because with this novel, less really is more. Set on an island off the coast of Seattle, the book opens with what seems like a flashback. I won’t tell you what that scene really is, because the main plot begins immediately after: a young girl is biking to the local minimart to meet her friends for the last slushies of the season, when a truck driver asks her for directions. She approaches, cautiously, and learns that the address the trucker is supposedly seeking is her own. From that point we jump into FBI agent Ash Severin’s world – he’s been sent to Carver Isle to manage the case, but unlike most feds, he works with the local law enforcement, not against them. At the same time, local girl Parker Kelly has returned home, ostensibly because she’s concerned for her aged mother, but once she arrives on the scene, weird things begin to happen. She hears the signature whistle of her psychotic cousin, supposedly safely locked up in prison, and feels his presence all around her. With her mother dying, and more children being taken, this is the last thing Parker needs. Ash and Parker initially don’t get along, but eventually her past and his present begin to intertwine – and so do they. Skin and Bones may be relatively short, but author D.C. Corso writes with a compelling style that is neither too florid nor too plain. Her descriptions are vivid when necessary, and vague when called for, and the characters and settings she describes seem like real people you may encounter in ANY small town. I would heartily recommend it to anyone who loves this genre of literature – it’s a great read…though I’d recommend against reading it in the bathtub while alone in the house. Trust me on that part. Review: Skin and Bones, by D.C. Corso by Melissa Bartell is licensed under a Creative Commons Attribution-NonCommercial-ShareAlike 4.0 International License.